Had you planned to hand craft a gift, only to realize that the holiday party is suddenly 5 days away? Where did the time go and what are you going to do? Never fear. There is still time. Even now. This is, however, not the time for fine yarns and complicated patterns. You need something quick and beautiful in its streamlined simplicity. We have just the thing. To start with: Funky Chunky (from The Third Piece). This is 100% super soft wool. It is a super bulky weight yarn, but there's nothing else 'bulky' about it. Its construction makes it surprisingly airy and light. The 'Wheat' colorway of Funky Chunky. Next, go to Ravelry and grab one of the free patterns from The Third Piece Design Team.or try Susan Mills' cowl from our latest Web-Letter. 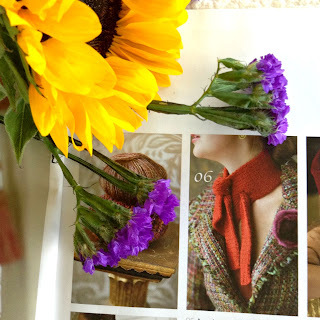 'The Beacon Mitts', the 'Funky Chunky Cowl' and both 'The Soho Headpiece' and 'The Soho Turban Hat' require only one skein of yarn. 'The Kendall' calls for two skeins, one for the hat itself and another partial skein for the fun pom pom on top. 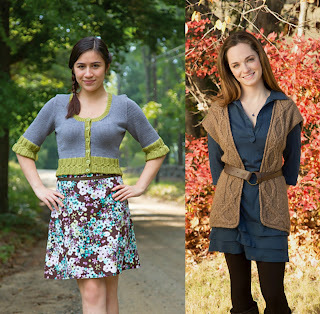 Grab your pair of large needles (patterns call for needles from size 11-17), settle into a comfy chair, and cast on. Two hours later (three hours tops) and you can have a super fashionable hand crafted gift to give. Who wouldn't treasure a gift like that? Did you see the free Valais Blacknose Sheep Mittens pattern in yesterday's Web-Letter #418? 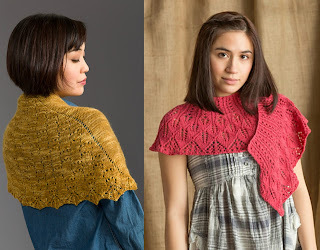 They're an adorable knit by designer Rachel Henry. The cute little sheep are added last, so these would also be fun in 3 contrast colors with bright stripes as the focal point. 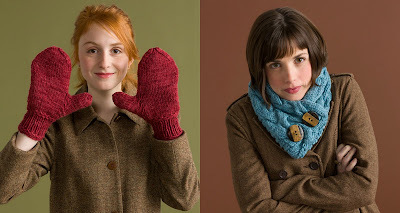 Two layers of knitting thick, these mitts use soft Fresco which ensures that they will be warm and gives you nearly forty colors to choose from. Rachel is a prolific designer and has written many other popular designs for our CEY Web-Letter and pattern books. She has a head for colors, construction, and how the two combine to make interesting stitch patterns really pop. 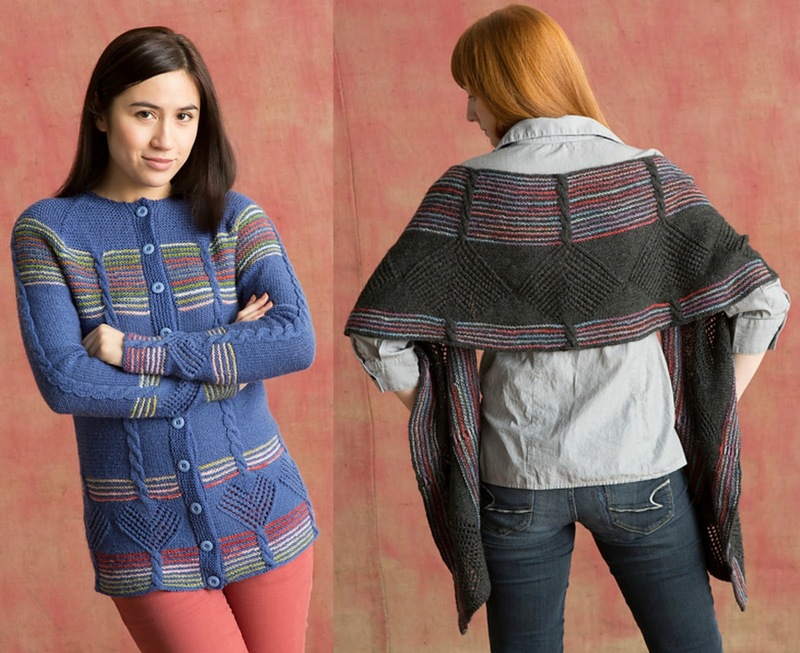 Both her Flying Colors Wrap and Flying Colors Cardigan were released in our 'All Seasons' pattern book. 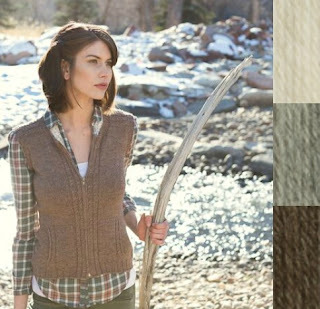 See how masterfully she combines printed spaced dyed colors and a solid in both Alpaca Sox and Liberty Wool Light below. All this while raising her 3 sons (currently 10, 13 & 16) and traveling with her border collies Gromit and Clewe for agility meets. She and Gromit placed 6th out of 132 teams at Cynosport World last week. Congrats, Rachel! Cardigan in Liberty Wool Light and Wrap in Alpaca Sox. Designers tend to have parts of the process that they're especially good at. Having spent a little time with Rachel, it's clear that she has skills in all areas of design. Still, it's the way that the math of both shape and lace construction seem to come to her naturally that strikes me the most. 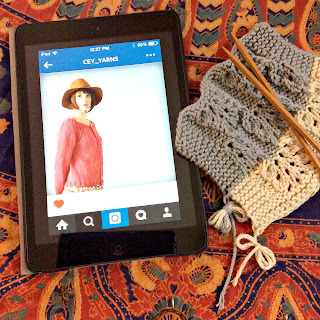 She says, "I would say my MIT education informs my knitting in important ways. One thing they teach, above all else, is how to take an unknown subject and dive in headfirst, consuming information and making it part of your own knowledge base. New yarn, technique and ideas are exciting...I'm rarely intimidated by something I don't yet understand". I think this all shows in the ease with which she seems to master lace motifs and then frame them in beautifully shaped wraps and scarves. 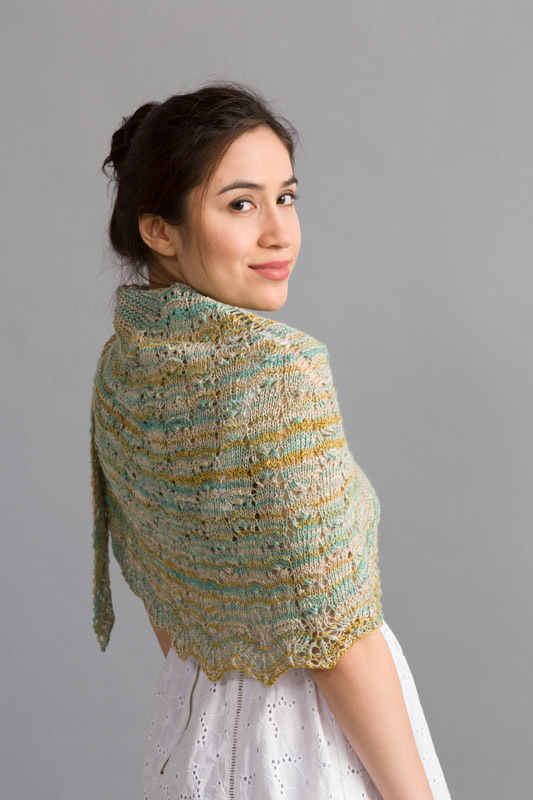 Wavelength and Kudzu Shawl both sprung from her creative mind. Here is Wavelength in Alpaca Sox, and Kudzu Shawl in Cerro. 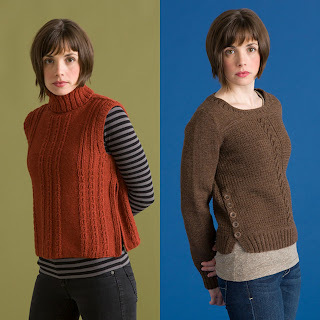 Rachel's patterns span the seasons. Love Lane is a great for the warmer weather, while her Braided Cable Vest can be paired with ever thicker layers underneath to span from early fall right though the deep cold of winter weather. Love Lane in Provence, and Braided Cable Vest in Chalet. Since her talents can be applied to so many different kinds of creative pursuits, you never know what she's got just around the corner. That means it's always a treat to see what she'll come up with for the next new design. Sometimes knitting friends choose to knit the same things. It often happens at the LYS where I go on Saturday mornings. 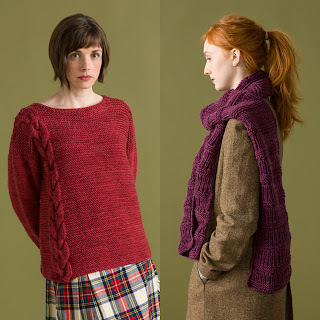 The interesting thing is that even though these knits are made from the same design, they come out different. Individual. When we set out to make something, there are so many choices to be made. 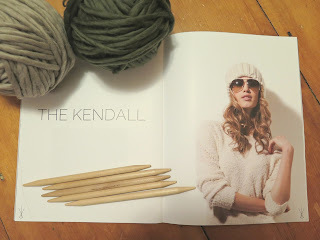 What will we knit? What color (or colors)? What notions will be used? And lastly, how will we wear it? So, let's say you're going to knit our new 'Sasha' poncho. 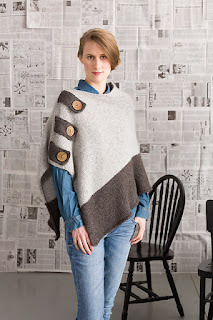 Here it is on Hayleigh knit up in the naturally undyed Steel and Charcoal colorways of Chalet. The warm tone of the wood buttons really makes them pop and she's right in style with her denim button-up and jeans. Now, how can you make 'Sasha' your own? The colorblocking and the buttons. 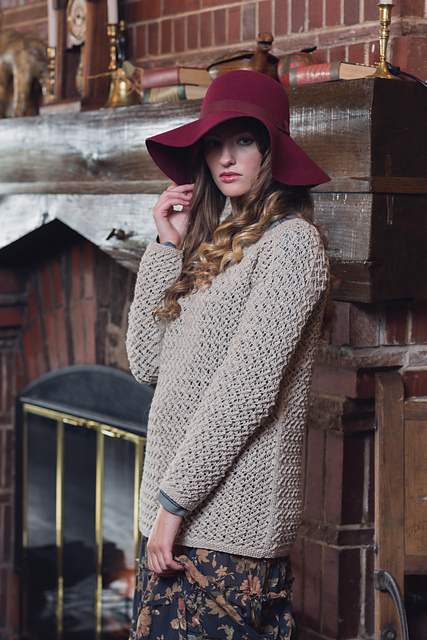 Being the focal points of this elegant poncho, what choices you make in those areas will have a big impact. Did you know that Chateau is the same luxurious fiber mix of alpaca and bamboo as Chalet? The only difference is Chateau's richly dyed hues. 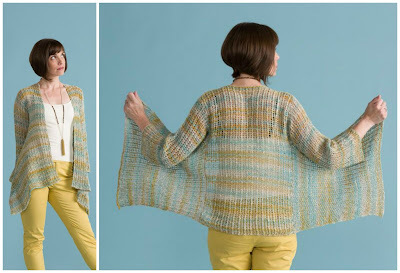 So feel free to mix and match these two airy yarns when choosing your color combo for this poncho. 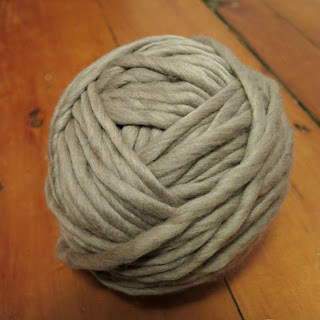 These yarns are chunky weight, which belies how light and airy they feel knit up. Once the knitting and blocking is done, it's time to sew on the buttons. Because they are large buttons and will be framed by the contrast color tabs, I think that what you choose can make a big difference in the overall look. Don't let that make you feel pressured. Instead, let it give your own creativity a place to shine. Then, let's put Sasha together with different buttons and style options to get a feel for what's possible. For an ultra feminine look, you could choose large abalone flower buttons, a flowy dress and a faux pearl necklace to top it all off. So pretty. Wanting a more casual look? How about pairing Sasha with a mid-length denim skirt, blue henley t-shirt and buttons in variegated neutral tones that match your main yarn color? This would be great for everyday errands and an easy way to add polish to any outfit. I love how the buttons add one more pop of personality to your own individual style. There are truly so many places that the ease and versatility of Sasha will make it just the right thing to wear. There are certain things that we are always on the lookout for: perfectly fitting jeans, truly comfortable shoes, and a go-to sweater. You know the cardigan I'm talking about. It fits like a hug. It looks good enough to run about town in. It goes with everything and it always makes the wearer feel better than the moment before it was put on. It's a lot to ask of a sweater, but isn't this the dream we have for each new cardigan project? We keep it at the back of our minds as we're carefully choosing a pattern, then picking the perfect yarn in just the right color. 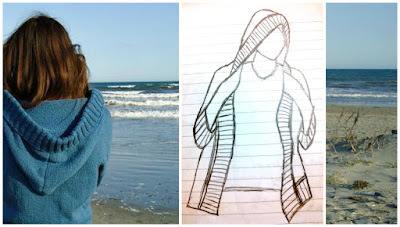 Seedling Hoodie by Tonia Barry in color Steele Blue. 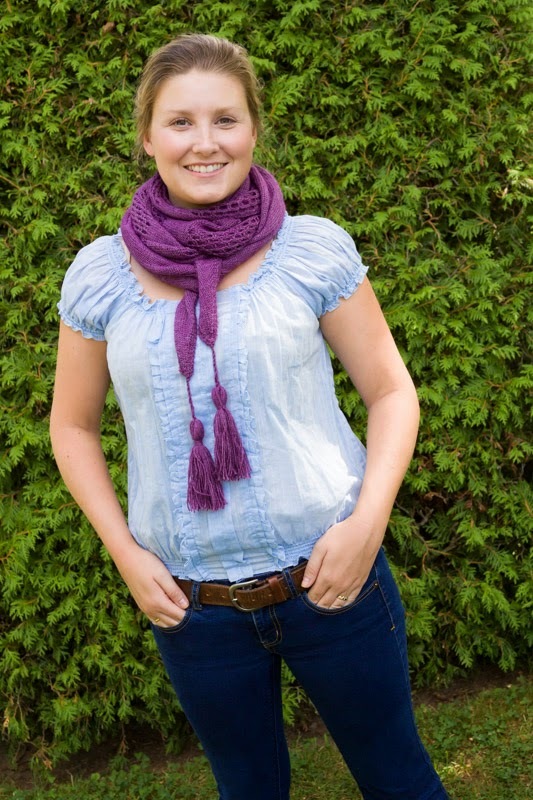 CEY designer, Tonia Barry, recently designed her own version of the perfect go-to sweater. She made sure to include all her go-to sweater requirements. 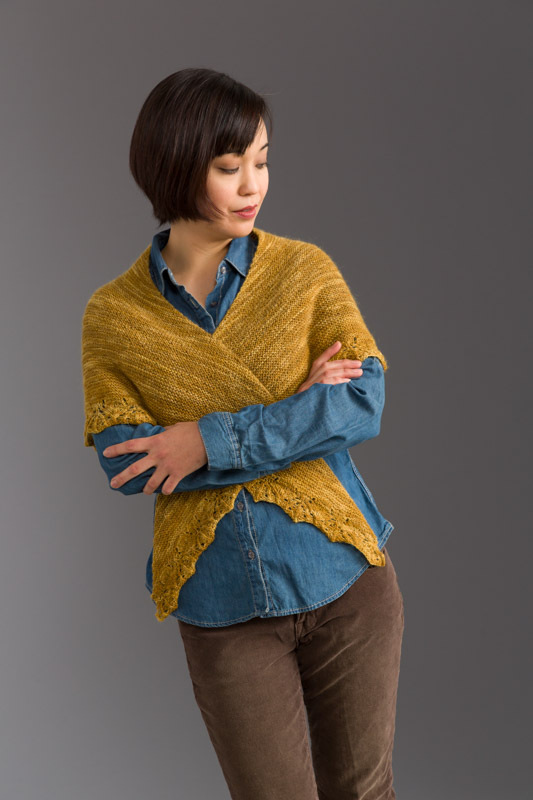 It's hooded, worn with a bit of positive ease, and knit up in Seedling, a beautiful organic cotton. Her pattern was featured in last week's CEY Web-Letter. 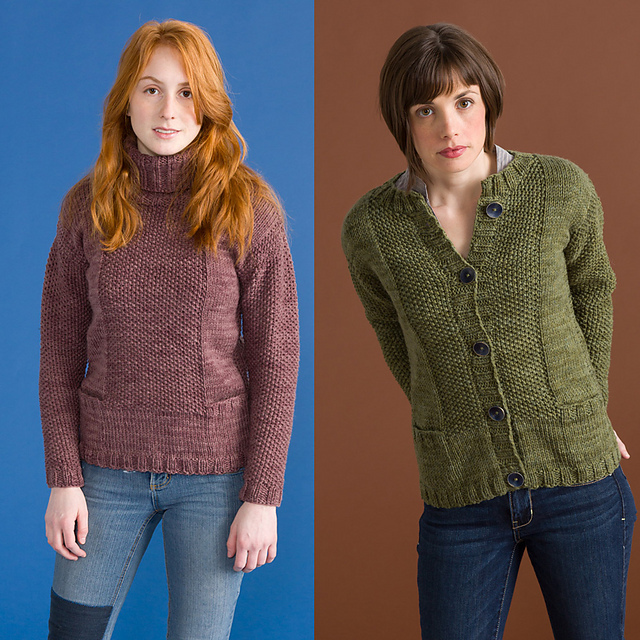 As knitters, we all have different opinions about what our go-to sweater needs to be. When I saw Tonia's hoodie, I could see her perfectly wrapped up in this cozy piece. 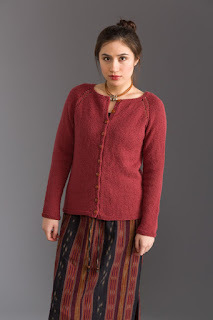 And while I adore this cardigan, my own dream sweater might be a little different. Would it have a hood? Long or short sleeves? Is it snug enough to be layered under a jacket or cozily oversized? Would it be a neutral color or some shade that really pops? There are probably as many different kinds of go-to sweaters as there are knitters who knit them. But then again, how we love to wear them. Do you know what yours looks like? June is one of my favorite months. Here in New England summer has truly arrived! But one of the best parts are the crisp warm days with limited humidity and comfortable, cooler nights. However……. as we all know, weather is fickle! Our newest pattern collection, Forecast, has plenty options to help cope with changeable weather and blasting AC. 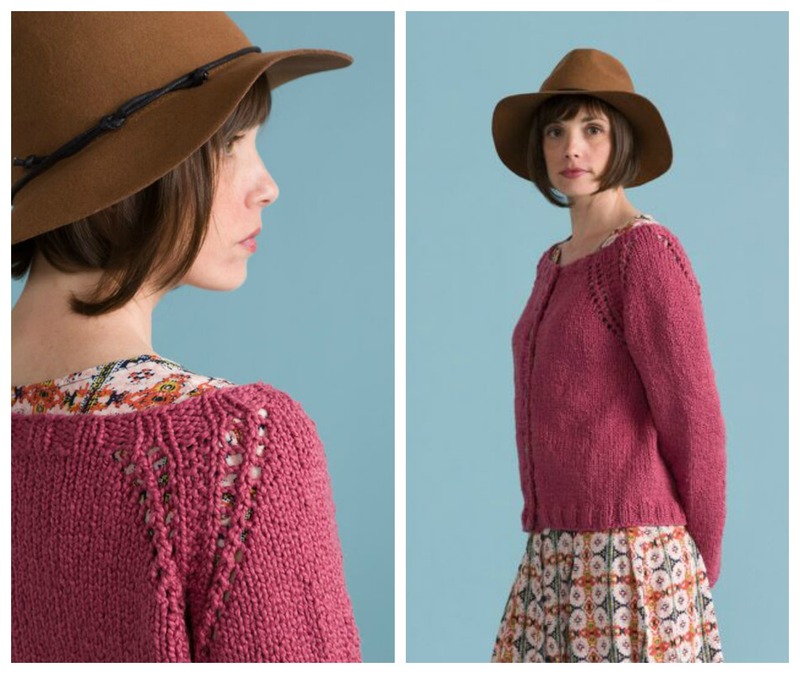 Fahrenheit, knit in Soft Linen – a great trans-seasonal yarn – has long sleeves making it perfect for cool nights. 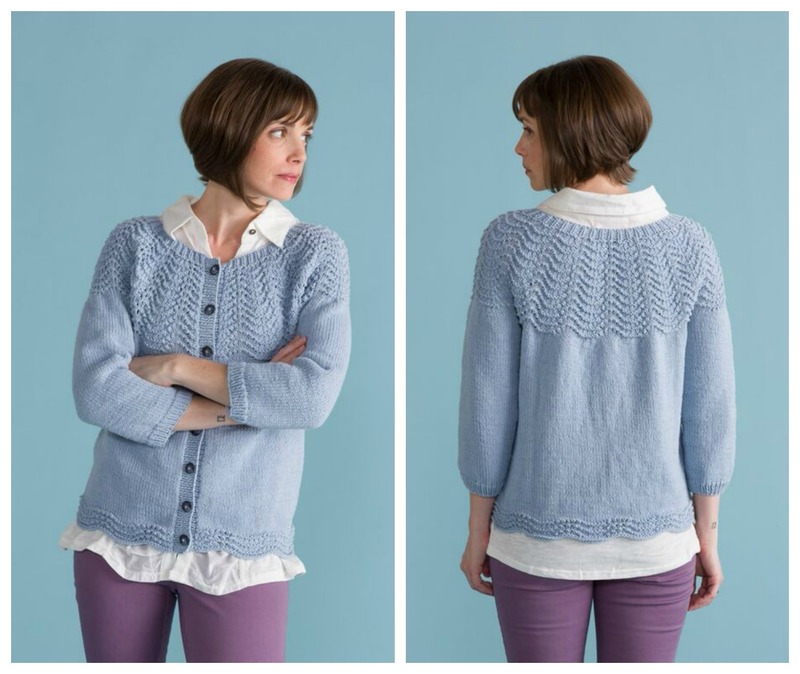 Ozone can be worn buttoned up to ward off any drafts, or open as a nice layering piece. 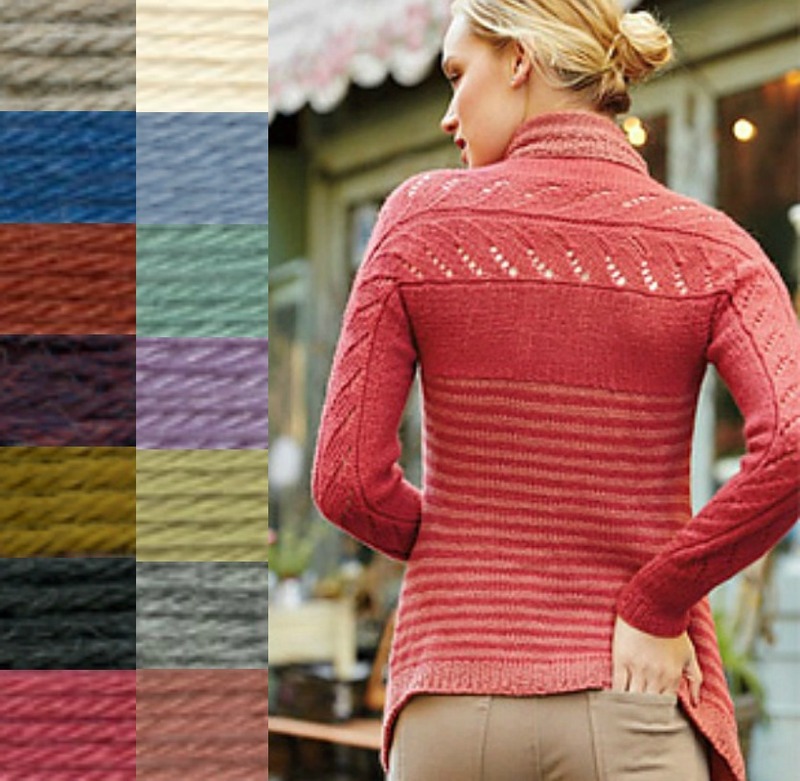 It’s knit in Classic Silk, a versatile and soft cotton/silk blend. Wavelength is a beautiful wrap – wear it over a sundress when the sun starts to set. Make it in Bella Lino for a crisp, cool linen finish, or if you are thinking about taking this piece into the fall season, try Alpaca Sox. 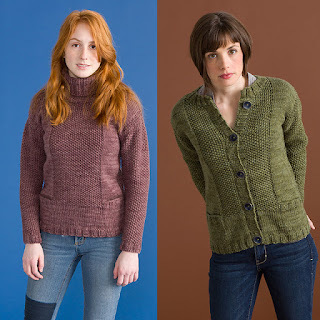 Both have beautiful colorway choices, in hand dyed and kettle dyed effects. Seedling, 100% organic cotton, is a comfortable layer for wearing next to your skin. 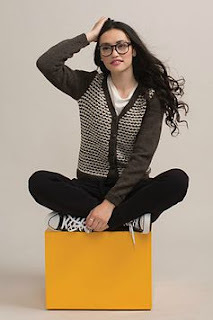 Choose to make a chic cropped version of Stratosphere or, for a go-to summer cardigan, opt for the long sleeved version. Have fun creating one (or more!) of these versatile designs from Forecast as you enjoy all that summer brings! I am lucky enough to live near a beach; actually many beaches. 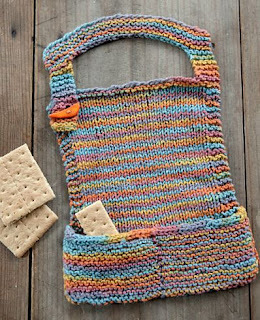 And I love to knit when I sit on the beach. There is something special about the soothing nature of the rolling waves, and the yarn easing its way through my fingers and making stitches on my needles. But beach knitting can’t be just anything. 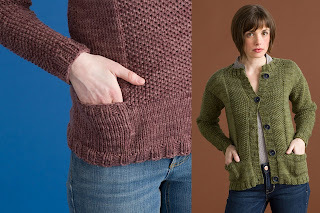 I remember a long time ago working on a very complicated colorwork vest, one that required a lot of yarn on bobbins. That was a challenge in any location, much less a breezy, sunny, sandy locale. And I don’t really like working with heavy yarn when I’m on the beach. But a lightweight wool is fine, and cotton and cotton blends are perfect. And one that is more mindless, for when I’m on the beach with other people, or when it’s a windy day. Since it’s going to be hard to narrow down my choices, I might have to plan for more than two projects. 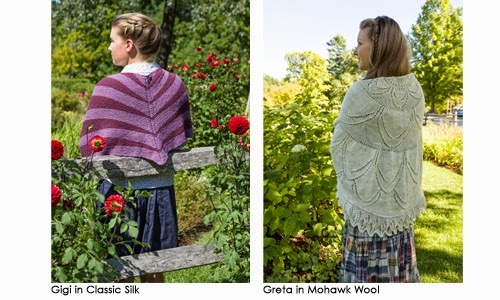 After all, there is also knitting while watching baseball, or by the pool, or at the cottage in the woods – or just knitting in the summer when there is nowhere to be but home! Do you knit at the beach or when you are camping in the mountains? Or in some other type of relaxing vacation setting? What is your summer knitting strategy? 1. 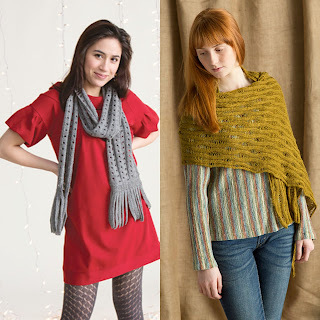 Scarves and wraps are usually quicker to knit than a sweater. 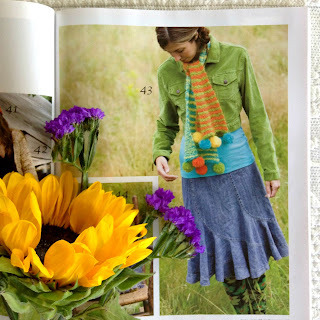 And knitters love to start new projects! The sooner you finish a project, the sooner you can plan and start the next one. 2. Since they are quick to finish (see above), you can shop for yarn more often. 3. No finishing. 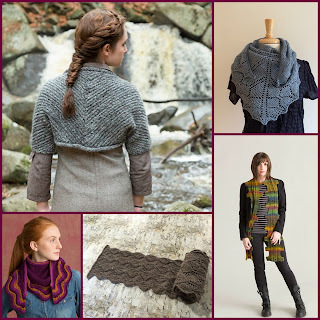 With rare exceptions, most wraps are done when then knitting is done. Weave in a few ends and it’s ready to wear. 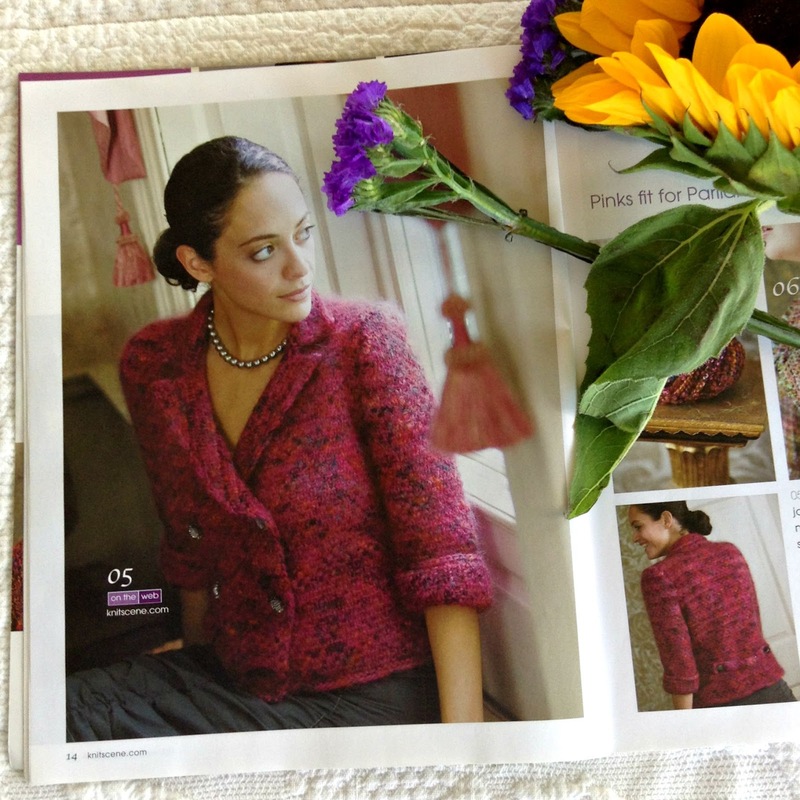 No tedious seaming, ribbing, or buttons to sew. 4. They always fit. 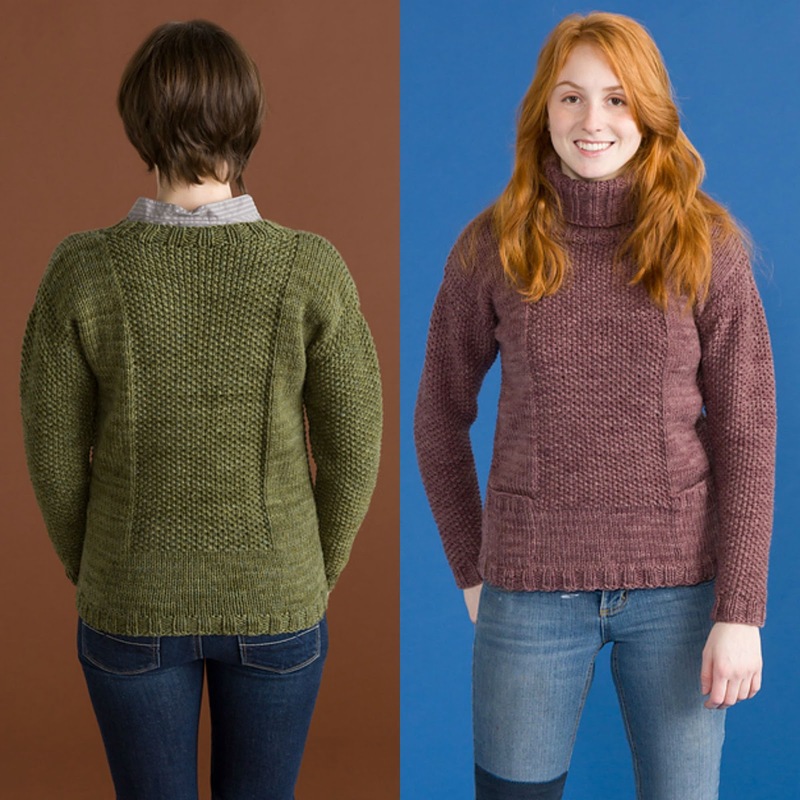 Nothing is more disappointing to a knitter than working for months on a sweater only to finish, try it on and discover it isn’t a great fit. If you wanted to wear a sweater that isn't flattering, you could save yourself a lot of time and go buy one. 5. They make great gifts. 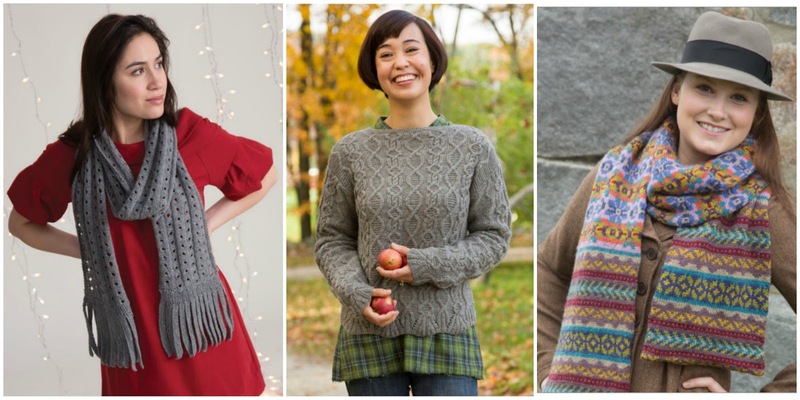 For knitting and non-knitting friends alike, handmade gifts are the best – and a scarf always fits (see #4 above!). 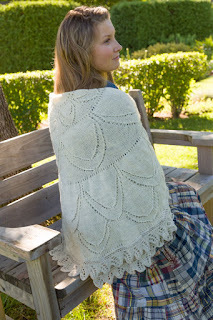 A quick glance at favorite projects on Ravelry confirms that wraps are very popular. 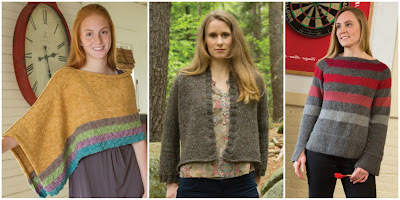 Our May pattern collection, Wrap It Up, is all about wraps. 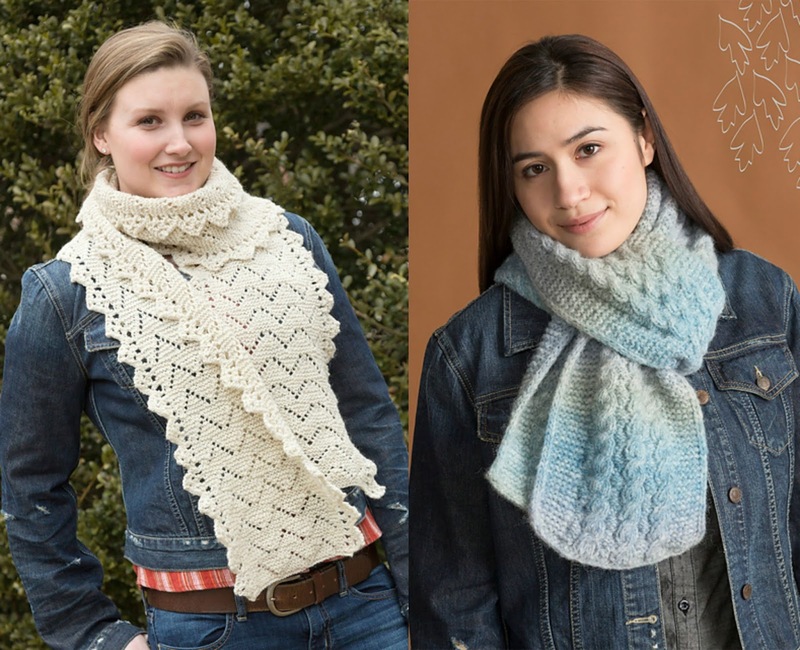 From rectangular scarves and stoles, to triangular and circular shawls, in garter, chevron, ridges, and lace and eyelets, Wrap It Up has a wide and diverse selection. As always, our printed books have a scratch-off code for a download of the entire collection. Or you can purchase individual designs as pdf downloads. Click on the cover below to see all the projects in the book.